Early in the fifth century, classical Armenian, or Krapar, was one of the great languages of the Near East and Asia Minor. Although an autonomous branch within the Indo-European family of languages, it had some affinities to Middle Iranian, Greek and the Balto-Slavic languages, but belonged to none of them. It was characterized by a system of inflection unlike the other languages, as well as a flexible and liberal use of combining root words to create derivative and compound words by the application of certain agglutinative affixes. In the period that followed the invention of the alphabet and up to the threshold of the modern era, Krapar (Classical Armenian) lived on. An effort to modernize the language in Greater Armenia and the Armenian Kingdom of Cilicia (11-14th centuries) resulted in the addition of two more characters to the alphabet, bringing the total number to 38. The Book of Lamentations by Gregory of Nareg (951-1003), that could be considered a masterpiece of world literature, is perhaps a good example of the development of a literature and writing style that came to be known as Middle Armenian or Vernacular. 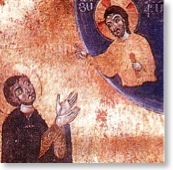 In addition to elevating the literary style of the Armenian language, Gregory of Nareg paved the way for his successors to include secular themes in their writings. The thematic shift from mainly religious texts to writings with secular outlooks further enhanced and enriched the vocabulary. “A Word of Wisdom,” a poem by Hovhannes Sargavak devoted to a starling, legitimizes poetry devoted to nature, love or female beauty. Gradually, the interests of the “vulgar population” were also reflected in other literary works. 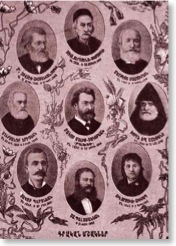 Konsdantin Yerzinkatsi and several others even take the unusual step of criticizing the ecclesiastic establishment and addressing the social issues of the Armenian homeland. Not surprisingly, these changes altered the nature of the literary style and syntax but they did not constitute radical changes to the fundamentals of the grammar or the morphology of the language. 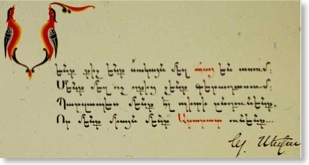 The Treaty of Kermanchai of 1828 once again divided the traditional Armenian homeland. This time, two thirds of historical Armenia fell under Ottoman control, while the remaining territories were divided between the Russian and Persian empires. The antagonistic relationship between the Russian and Ottoman Empires led to creation of two separate and different environments under which Armenians lived and suffered. Halfway through the 19th century, two important concentrations of Armenian communities were constituted. Because of persecutions or the search for better economic opportunities, many Armenians living under Ottoman rule gradually moved to Constantinople, the capitol of the Ottoman Empire, while Tiflis (Tiblissi), in Georgia, became the center of Armenians living under Russian rule. These two cosmopolitan cities very soon became the primary poles of Armenian intellectual and cultural life. Western Variant: The influx of immigrants from different parts of the traditional Armenian homeland to Constantinople crystallized the common elements of the regional dialects, paving the way to a style of writing that required a shorter and more flexible learning curve than Krapar. Eastern Variant: The dialect of the Ararat plateau provided the primary elements of Eastern Armenian, centered in Tiflis (Tiblissi, Georgia). Similar to the Western Armenian variant, the Modern Eastern was in many ways more practical and accessible to the masses than Krapar. Both centers vigorously pursued the promotion of Ashkharhapar. The proliferation of newspapers in both versions (Eastern & Western) and the development of a network of schools where modern Armenian was taught, dramatically increased the rate of literacy (in spite of the obstacles by the colonial administrators), even in remote rural areas. The emergence of literary works entirely written in the modern versions increasingly legitimized the language’s existence. By the turn of the 20th century both varieties of the one modern Armenian language prevailed over Krapar and opened the path to a new and simplified grammatical structure of the language in the two different cultural spheres. Apart from minor morphological, phonetic and grammatical differences, the largely common vocabulary and identical rules of grammatical fundamentals allows users of one variant to understand the other easily. After the First World War, the existence of the two modern versions of the same language was sanctioned even more clearly. The Soviet Republic of Armenia (1920-1990) used Eastern Armenian as its official language, while the Diaspora created after the Genocide of 1915 carried with it the only thing survivors still possessed: its mother tongue, Western Armenian. To appreciate the cultural-linguistic importance of Western Armenian requires an understanding of the historical imperatives at play: For years now, particularly with a new generation of Armenians in America raised without the opportunity to learn the language, Armenian identity for many began and ended with the Turkish genocide of 1915, the genocide that spawned the birth of Armenian dispersion. Armenian identity, politics, religious beliefs and world vision have been dominated by this terrible event. This dominance has been reinforced by a stubborn and self-serving Turkish denial of the genocide, of responsibility for it, and even of the historic existence of Armenia. The historic aim in the Diaspora has been to re-convince the world of the truth of a single event--in order to establish a past that can explain the present Armenian condition. For Armenians living in the Diaspora, in addition to defending the historical record, preserving the linguistic and literary heritage is an important part of the struggle. Language is the inventory of human existence.